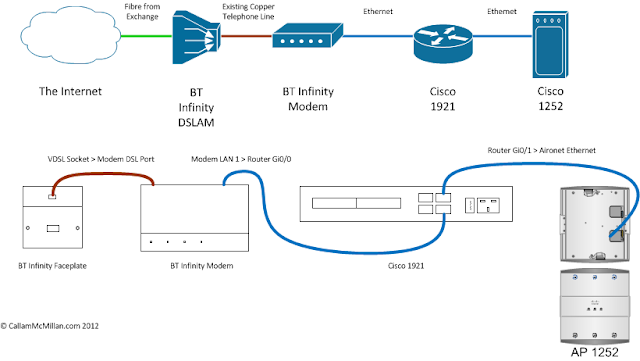 BT Infinity on Cisco Router: Read This First! CallamMcMillan.com > Networking > BT Infinity on Cisco Router: Read This First! BT Infinity – BT’s implementation of Fibre-To-The-Cabinet (FTTC) is great, especially when you compare it to standard broadband. Sadly the same cannot be said for their provided router (the HomeHub) which is useless, and happens to use your bandwidth to provide a publicly accessible hotspot for any pleb to come along and use. This guide will talk you through setting up a Cisco router to take the place of the HomeHub and teach you how to avoid some of the pitfalls that may otherwise blight your installation. First of all, you need to understand the hardware you have and what you will be replacing it with. BT will supply and install you both a modem which is a small white box that connects to the VDSL outlet of your telephone point, and the HomeHub which is your wireless router; as shown in the photos below. It is possible to replace both the modem and the router with Cisco hardware by purchasing a Cisco HWIC-1VDSL card. However this presents two problems, first, you run the risk of them not playing nice with BT’s network and breaching BT’s ToS which seem to suggest that you may not replace their modem. Some people have however managed to do this, although the cost is prohibitive; a HWIC-1VDSL I found on eBay (See below) was about £300 for the card alone. 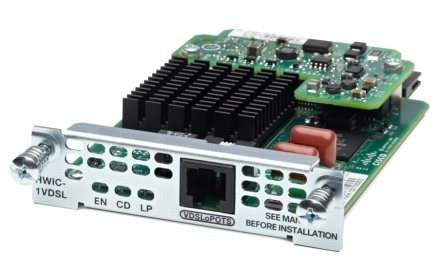 Finally the use of this card restricts you to the Cisco x900 series routers which are massively expensive to buy, and even more so if you want the advanced feature sets. The setup for this discussion is a Cisco 1921 router with 2 onboard Gigabit Ethernet ports and a Cisco 1252 b/g/n Aironet. The physical and topological configurations are shown in the following diagram. The VDSL line from BT’s DSLAM terminates into the DSL port of the modem. An Ethernet cable then runs from the LAN1 port of the modem to the first gigabit Ethernet port of the router. A second cable then runs from the second gigabit Ethernet port on the router to the Ethernet port of the access point. You’ll notice that the whole setup sits on the shelf of a small coffee table just inside the front door of the house where it is situated. The reason for this (rather than it being neatly installed in a cupboard somewhere) is that there is a problem with the Infinity system that BT fail to explain in their advertising. In a traditional ADSL setup, your drop cable from your telecoms provider terminates at the NTE5 box (The master socket) somewhere in your house – usually a living room or hallway, but from here you can then run extension cables to slave points throughout the property. With BT Infinity you can’t do this since the NTE5 faceplate is replaced by a VDSL faceplate which can’t be extended via the building wiring. The alternative, as was the case with the previous Cisco installation job (Link) is to run the connection between the modem and the router via Ethernet. If however you want to keep all your equipment in the same place, then the best thing to do would be to extend the drop cable to your comms rack and terminate it into a NTE5 there so that when BT perform the installation, everything is in place in the rack. Now that the hardware is in place, the router and wireless access point need to be configured. The first pitfall that you may encounter is if you attempt to establish a connection using a standard Ethernet configuration on your WAN port; in this case your router will simply fail to connect since unlike the Virgin Media modem which handles the authentication, the BT modem does not, you have to do this this via PPPoE. The second pitfall is much trickier to diagnose and resolve. Once you think you have successfully configured everything, you’ll be able to get online… But only to some things – Google will work for instance, as will Skype, but most websites will not. The reason for this is that packets are being returned out of sequence and are being dropped, causing connections to fail. The solution to this problem is careful adjustments of the MTUs on the interfaces. This configuration is intended to have a reasonable degree of security, so we’ll set up user accounts and SSH access at this stage. to create a administrative user account the syntax is “username [username] privilege 15 secret [password]”. Looking at the configuration as it is saved, the password component of the user account will now be stored as a MD5 hash. The command to enable SSH is “crypto key generate rsa” and then follow the on screen prompts. This article contains more information on the process of enabling SSH (Link). Finally we’ll restrict SSH to clients using version 2 only since SSH1 is considered broken, we do with “ip ssh version 2”. speed basic-1.0 basic-2.0 basic-5.5 basic-11.0 basic-6.0 basic-9.0 basic-12.0 basic-18.0 basic-24.0 basic-36.0 basic-48.0 basic-54.0 m0. m1. m2. m3. m4. m5. m6. m7. m8. m9. m10. m11. m12. m13. m14. m15. speed basic-6.0 basic-9.0 basic-12.0 basic-18.0 basic-24.0 basic-36.0 basic-48.0 basic-54.0 m0. m1. m2. m3. m4. m5. m6. m7. m8. m9. m10. m11. m12. m13. m14. m15. You should be able to do this without any MTU/MSS adjustment and leaving defaults (MTU1500) as the BT modem supports ‘baby jumbos’ as does your 1921. That’s how I have it working. I’d just like to say thank you ever so much! You’ve helped me along the way getting my Cisco 1912 setup with my EE fiber line. Been playing around with it for the last few days but this has been a gem of a guide! Without an MTU/MSS adjustment, internet access was patchy to non-existent. Skype connected fine, as did the Google homepage. If you tried using Google or accessing any other website however, the browser would simply sit there trying to load the page – without success. Once the MTU/MSS values were adjusted per the guide above, full connectivity was restored. Thanks for the article. I’m considering a similar set-up. I wondered what speeds you are achieving with this configuration? Do you reach the Infinity line speed? Yes, this setup allows you to reach your maximum line speeds. I am running a Cisco 3845 at home on a fibre package offering 72/19 and I regularly get this. Thanks for that SGS. I will try it next time I rebuild my configuration. I’m not sure if a few extra bytes per packet will make a huge amount of difference to my connection speed, but it seems a shame to waste bandwidth. I’ve gone ahead and bought a 1941 to set up something similar to this, so thanks for the guide and the reassurance about the speeds. I’m just planning my deployment now, but one thing is confusing me. What is the best way to, for example, allow access to a host from the outside. I can statically map the port, I believe, but do I also have to add an entry to the inbound ACL (101 in your example)? I’ve gone ahead and bought a 1941 to set up something similar to this, so thanks for the guide and the reassurance about the speeds. I’m just planning my deployment now, but one thing is confusing me. What is the best way to, for example, allow access to a webserver from the outside. I can statically map the port, I believe, but what to do about the inbound ACL (101 in your example)? This will allow traffic through to your router so it can forward it to your web server. Hope this helps. is what I imagined also. However, I’m having trouble understanding how this works. IP 10.20.30.40 is in the local LAN behind the NAT. I’m wondering if the packet from the Internet that the ACL receives will reference this address, or if it will be addressed to the public IP instead. I’ve a suspicion that the ACL will be checked first, that is before the static NAT is applied, and so this rule won’t match? James, you are quite correct to be confused because I have just spotted my mistake! The above example only works when the address of the web server is known such as on a WAN. On the Internet you will have at least one public IP address that you wish your web server to respond to. You then need to permit traffic directed at that address. 1. Traffic arrives at Port 80 of your public IP. 2. As it matches the rule, it is allowed into the router. 3. A NAT rule changes the packets destination to the local address of your web server. 4. Your routing rules then send the packet where it needs to go. Again, I hope this helps and please reply if you want any more help. Callam, it is a relief that I wasn’t going completely mad. It is quite an involved configuration as I’m just starting out with Cisco kit. Thanks for the clear explanation. This seems to be “less secure” than specifying the public IP, but as there is only one public IP, and as there then follows a NAT, I believe it should be OK. It would be interesting to hear your thoughts. James, that’s an interesting conundrum. Yes, using an any any rule would would work. While technically it would be less secure it shouldn’t actually matter for all practical intents and purposes. If you are looking for absolute stability then I would consider the above to be good enough. If you like to experiment though, perhaps you should take a look at the following: https://supportforums.cisco.com/document/66011/asa-using-hostnames-dns-access-lists-configuration-steps-caveats-and-troubleshooting – It was intended for the ASA devices, and I don’t know if it will work on IOS. If you set this up, then you can get yourself a dynamic DNS domain name from someone such as no-ip.org (This isn’t production class, but neither are non-static addresses.) Then you can use your domain name in the ACL. Of course, a third way, if it possibly applies to you is to look at an alternate ISP. I am using Plusnet’s version of BT infinity which is as fast as BTs, cheaper than BTs, and I got a static IP for them for a one off fee of five pounds. It also allows me to map a domain name back to my private IP. I have a 2811 Cisco router that I would like to use and I cant get it to work. I dont think its the configuration you have supplied but the setting on the TalkTalk Router. Each one has a setting that can be adjusted, please could you provide instructions for this bit. I’ve just read your problem and I’m a bit confused. From the sounds of it, you’re trying to connect your Cisco router through a TalkTalk ADSL router? If that’s the case, then this config isn’t going to work. Drop me an email at callam@callammcmillan.com and I’ll try and give you a hand if you’re interested. Hello, I did email you just after I posted the last message and I got message sent failure back about 10 minutes later. Ill try again, please email me, I know email can be funny sometimes. I’ve replied to your email. We’ll continue this conversation in private. Gordon, you’re absolutely right, and if you’ve done CCNA Security and know what you’re doing, then I would fully encourage you to do that. Did you have any luck on getting this to work with TalkTalk? i found your post very interesting and having a 2811 handy i’m thinking of giving this a go, what would be an acceptable ios to use on the 2811 for security and compatibility with connecting to the BT modem, at the moment it has 12.4.24. I too are with plus-net and i’m finding their router to be a pain and often thought of hooking up a cisco to do the job properly..
12.4.24 should be an acceptable operating system for getting online. It’s a bit dated now, but if that’s all you have access to, then go for it. From there, and depending on your prior experience, start small and build up what you ask of the router over time. Feel free to ask for more help here, and let us know how you got on. We are trying to get an ASA 5505 working connected to an ECI BT VDSL modem. The ASA is doing the PPPoE authentication but the speeds are lower than expected – only 5-8Mbits up/dn. I think it is to do with duplex MTU and MSS settings but as we can’t access the ECI modem we can’t check and the ISP is relucctant to ask BT!? I have tried different duplex and MTU sizes but the MSS has always been 1380. The MTU is currently 1490. These seemed to give the best performance as much as possible. We know the line is capable of going as high at 40Mbit dn. Thanks for uploading such a gr8 guide for configuring the router with BT infinity connection. we got the BT connection with 8 static ip addresses. With the above configurations i am able to connect and access internet and also able to connect with other sites using DMVPN. But i am not able to utilize the static ip addresses – i have created the NAT rules and assigned public ip to internal ips and also created respective ACL for outside too, but i am unable to connect to any of them from outside. Can you please put some light on it in case we need to perform few more things in case we want to use the ip range assigned to us. my own blog soon. Anyway, if you have any suggestions or tips for new blog owners please share. You might demand a new modem and buy a hub that is new. I highly recommend the Netgear WNDR4300 – excellent range/velocity and most significantly may have DD-WRT installed. new router/device. It is a far more flexible (and lets me handle me and my 4 room mates links manner better than default option applications). Interesting. I’ve always been aware of the DD-WRT suite, but have never actually used it. At the moment I’m playing with the pfSense software, which turns ordinary x86/x64 hardware into a high power router. My concern with things such as DD-WRT are that while the software may be good, you have to flash it to mediocre hardware. Plus, if you buy it new, you’re likely to void your warranty. Great post, helped a lot to sort out my 867, a bit more complicated because I had to configure a VLAN for the internal network and not a dedicated adapter but this post got me on the right path. Just for info, I’ve been having all sorts of fun with MTUs on my PlusNet PPPoE broadband. I had the “ip tcp adjust-mss” commands you’ve listed above on my VLAN and the Gigabyte adapter that was bound to the dialar and this would cause sound clipping on YouTube videos. If I removed “ip tcp adjust-mss” from all but the dialer interface then YouTube would work but I’d have issues with other services. The compromise I got to work was just have the “ip tcp adjust-mss” command on the VLAN and that works perfectly. It been a very long time since I used Cisco (think dial-up and 64k leased lines). For info this was my final configuration. Hopefully this’ll help someone else in the future. A great read – I posted something very similar on the BT Community care forums a few years ago where I worked with Cisco TAC to address the throughput and DNS / loading issues (and where the MSS came up). I’ve just moved onto FTTP with a 1941 router and getting disappointing results. Throughput on the BT Hub 6 (cabled) is in the region of 204mb/sec which is fantastic. When using a combination of this and the minijumbo frames (1500/1508 byte) config, I’m peaking out at approx 96mb/sec…! Interfaces coming up at Gig/Full and showing the correct MTU. I can ping out with large sized packets (non fragmented). Very odd! All other infrastructure remains in place (3750X switches, AP’s and controllers) to discount those from being the issue with the BT Hub 6. I’m afraid this is a little beyond my capability to diagnose, but hopefully one of the readers may be able to share a solution with you. That’s a useful reply, thank you. Is there any chance you can share the link to the routing speeds of the newer routers? My one is a few years out of date now. Just wanted to say a big “Thanks”! I’m studying for my CCENT/CCNA and this was a great project to practice what I’d learned. Firstly, thanks for taking the time to write this up. I have a cisco 887 with built in VDSL modem and was abole to use some of this config to get me running. I have a question regarding access list 101. Why do yo block all private IP addresses? I haven’t got much of an access list on my setup and am curious as to whether this is an entry point for an attack? I didn’t think you would be able to receive any traffic from private IP’s. Also, I’ve always been under the illusion that NAT gives a degree of protection as any random packets would be dropped unless the port is specifically forwarded. I am not a Cisco expert, just studying for my CCNA. So these may be daft questions, but I’m interested to hear your thoughts.